McLaughlin came to St. Bonaventure from Colgate University in Hamilton, New York, where he had an outstanding athletic career. He played end for the Red Raiders. His coaching tenure lasted from 1915 to 1921. In his 7 years, Coach McLaughlin compiled a record of 13 wins, 22 losses and 6 tied ball games to end up with a .371 winning percentage. The lowest percentage of all the St. Bonaventure football coaches. The program was just starting and getting recruits wasn't easy. He did well to help the football program grow in its most crucial years. He also taught mathematics at the college. He stopped coaching in 1921 to maintain a focus on his teaching activities at the college. "Shine" lived in Olean until he passed away in 1934. Coach Carmont was the first alumni of St. Bonaventure to take the reins of the new football team. He coached for two years and had a record of 6 wins 10 losses and 1 tie game. He was one of Coach McLaughlin's many student assistant coaches. 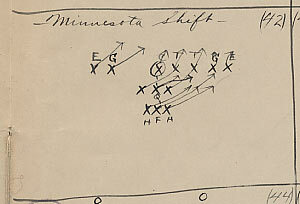 The promotion to head coach came in 1922. Carmont coached basketball from 1920-1923. His teams went 2-13 in 1920-21, but ended 12-10 in 1922 and 13-10 in 1923. Coach Carberry's basketball record was 6-4 for 1924, 13-11 in 1925, 15-6 in 1926. Coach Ostergren arrived at St. Bonaventure in 1926 and went on to complete 13 wins 16 losses and 4 tied games. Ostergren's basketball record was 14-7 in 1927-28. Ostergren also coached baseball during his tenure at St. Bonaventure. Mike Reilly was one of the most loved and respected coaches in the Bonaventure community to ever teach the game. 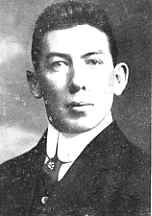 He served as an assistant to Fred Ostergren and landed the head job in 1930. His 13 year tenure has a record of 44-44-7; the first coach to end with a .500 percentage or better. After coach Reilly passed away, the main athletic arena on St. Bonaventure's campus was fittingly named the Reilly Center after the legendary coach and great Bonaventure man. 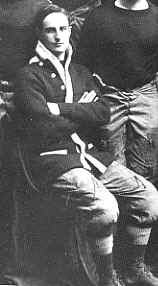 Standing--Henry Buniski, John "Skip" Rucinski; Ted Stewart. The University of Notre Dame is the institution St. Bonaventure must give thanks to for letting coach Devore land in the re-established Bona football program. 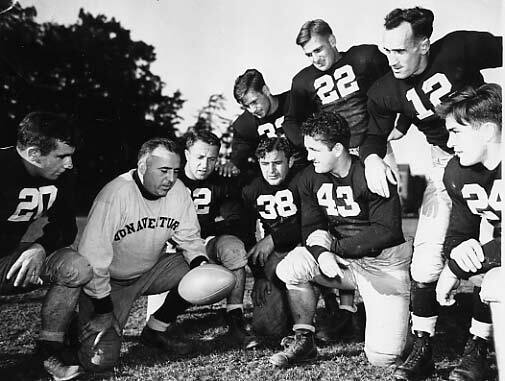 Coach Devore has the highest winning percentage of all who ever coached football at St. Bonaventure with a .735. 25 wins, 9 losses and one tied game was his coaching record here at St. Bonaventure. He also saw the creation of Forness Field. This picture was taken at Devore's introductory dinner as St. Bonaventure's coach. 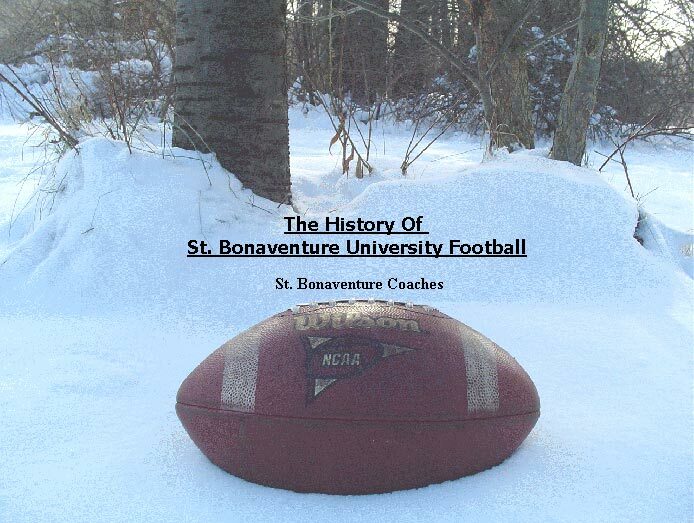 The final years of the Bonaventure football team saw Coach Bach at its helm. Yet another Notre Dame defector, Bach ran up a 12-6 record in his two year stay. 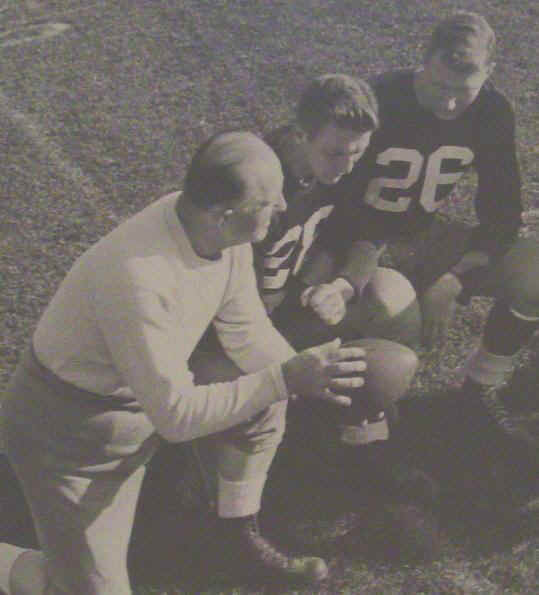 Here he is shown with Ted Marchibroda, and Jerry Hanifin. Wallace, Malcolm V. "Mike Reilly-a Bonaventure Man." The Bona Venture (4 Feb. 1972): 6. Wallace, Malcolm V. Heroes of the Hardwood : The Saint Bonaventure Basketball Book. Unpublished typescript for basketball data.